Shopping for your exact body type and finding clothes that you both feel comfortable and confident in can be difficult, especially with so many options on the market. From petite to tall, plus size to maternity, stores offer many ranges of clothing - it can be confusing to gauge which one suits you, but this guide will help you understand each one, and find the size that’s best for you. Many people think that petite clothing is about body shape and weight but in fact, it has nothing at all to do with that. Petite clothes are specifically designed for women 5ft 4in and under, who in general have shorter torsos, arms and legs and narrower shoulders. Petite trousers and jeans have a shorter leg length than regular; shirts, tops and jumpers have a smaller sleeve and length; and skirts and dresses are shorter in length and have higher waists. They are specifically designed to flatter shorter women, make them look taller and feel their best. Regular clothes are made for women who are average in height - between 5ft 5in and 5ft 7in. Regular clothes are widely available, so women in this category will have plenty of choice when it comes to shopping. Women who fit into regular clothing vary in shape and size, and regular clothes are available in all UK women’s sizes. Regular trousers and jeans are 32”, while skirts and dresses vary in length according to their design, but regular items should fit women between 5ft 5in and 5ft 7in well. Tall clothes are intended for women 5ft 8in and above, and are designed to shorten and flatter the taller woman’s figure. Tall clothes are made with longer sleeves and hems, whilst jeans are made with a leg length of 34” on average, although you can get longer leg lengths in some stores. 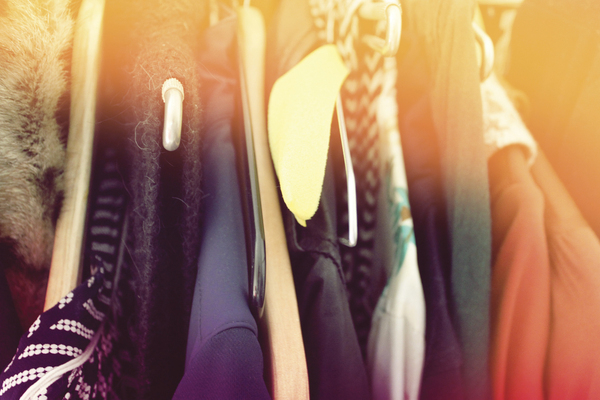 Tall clothes are available in the majority of UK women’s sizes and many stores online. Plus size and curve clothing is designed for curvy women and offers pieces that are flattering for that shape. 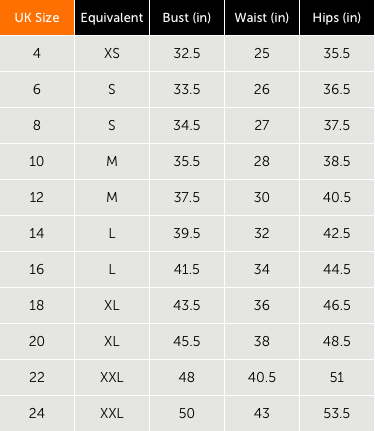 The sizes of plus size clothing vary from store to store, but most retailers offer clothes in UK 14-32. Clothes are usually made with longer hems, wider straps and more room around the bust, arm and stomach area than standard clothing. Many stores have a dedicated curve section with specific pieces designed with curvier women in mind, whilst some retailers offer the same clothes but in bigger, more inclusive sizes. Maternity sizes work the same as regular clothing sizes, so if you were a size 10 before pregnancy, you’ll still be a 10 in maternity clothes. Maternity wear is specifically designed and tailored for pregnant women, with extra fabric and details that keeps women comfortable during pregnancy. Jeans have stretchy belly panels, tops are longer and wider to ensure they fit over the bump and details like buttons and zips are left off to ensure they don't stick into the bump. Many retailers offer a designated maternity section in UK sizes 4 and up. To find out more about ASOS sizes, click here. And for Boohoo’s full size guide, click here. M&S’s regular clothing line ranges from 6-24, a slight overlap with their specific petite range available in sizes 6-18 and plus size ranges at sizes 18-32. They don’t have any maternity clothes on site, but do offer maternity underwear and loungewear. 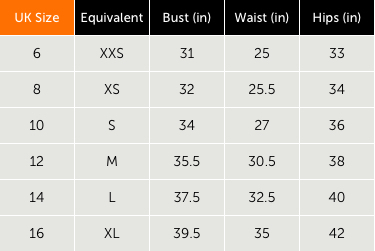 See the table below for how M&S’s sizes measure up. To find out more about M&S’s sizes, click here. Or click here for a full size guide from Missguided. To find out more about New Look’s sizes, click here. For Prettylittlething’s full size guide, click here. And click here for their full size guide. Or click here for more information on Superdry’s sizing. And if you want to stay up to date with the latest fashion news, trends and styling tips, read our blog.